For Le Chien, I needed to take a trip to LA Fabric District to get unique and special fabrics for the dog fashions I will make for the show. As you know from my earlier posts, Le Chien is the Dog Fashion Show the kicks off Palm Springs Fashion Week El Paseo and benefits the Humane Society of the Desert. This year the theme is Fashion from the 80’s and I’m the designer of the dog clothes for the show. 26 dogs, 26 outfits plus two outfits for dogs walking in the Donor Section of the show. That means fabric and more fabric. So, on a Thursday in February I hopped in the Spoiled Dog Designs Van and took off at 6AM hoping to beat some of the traffic….who was I kidding. On Hwy. 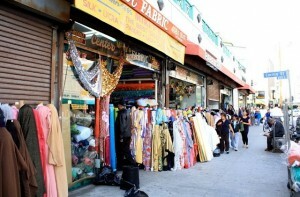 10 on the way to LA Fabric District. After 3 1/2 hours of driving I got to the Fabric District, parked in my favorite parking lot, grabbed my Homeless Lady Wheelie Cart and off I went. 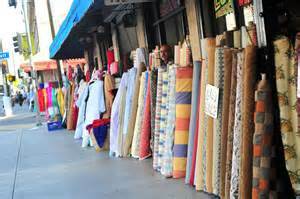 My time in the LA Fabric District is mostly spent on Wall, Maple, 8th and 9th with journey’s down adjoining blocks. I had a list of basics that I needed so I took care of that list first, like huge rolls of bias tape for harnesses, a bolt of 60 yards of faux fur for Stroller Pads, then I set about looking for special fabrics for Le Chien. Now the fun begins! I had printed out a picture of each dog and written their measurements on the page so I could look at the pictures and talk to the dogs hoping they would talk to me. Do you like Yellow? Would you like a jacket in this beaded fabric or is it too over the top? How about pink? I walk into a store and get WOW’ed by a fabric I see. I love it so much I have to get it and I’ll figure out which dog it fits later. That’s what happened with the fabric I’m using for Vendetta, the Great Dane. I almost wanted it for myself but I haven’t sewn for myself in decades and with so many dogs to dress this is no time to start again. 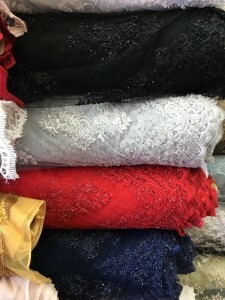 But I did let myself fall asleep that night thinking of the great dress I could make for myself out of it…..don’t listen to this, Vendetta. Its for you and I’ll wear “Off The Rack”. I have a vision of an outfit, like a Smoking Jacket for Rainey, and go in search of the right fabric for that look. And, I found it! I see a fabric and a dog’s name screams out at me…..OMG! That’s the perfect fabric for Annie! Sold! I walk around with the dog’s picture, even show the picture to the store staff, tell them what I’m doing, about the dog’s personality and how I envision their outfit, and look for the right fabric that would fit that dog perfectly. Like pale pink, very girly for Murphy. You’d think that at these wholesale fabric stores they would laugh at me doing a dog fashion show but most of them get into it. If they don’t I go somewhere else. But, sometimes what happens is that I worry, wring my hands, struggle and can’t choose between a few different ones. Is this the right one? Is that one better? So I buy them both and I’ll figure it out later. That happened with Scruffy and Snickers who I was making matching outfits for. I bought two very different fabrics home and lived with them for a while until I made my decision. I’m very happy with the one I settled on. And, I’ll use the other fabric for something else some day. Bolts of fabric on the wall of one store. 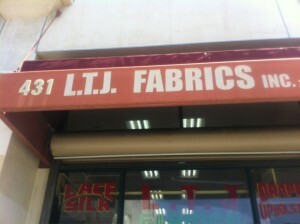 I found a new store, LTJ Fabrics, on 9th, with a great guy, Jonathan, that was a huge help. He had just given his mother a Maltese puppy that he had fallen in love with so he could relate to what I was doing. I picked out Jake Dietrich’s fabric but wanted something for his brother Mickey that went with it. Jonathan pulled out bolt after bolt so we could spread them on the table next to Jake’s fabric to see which ones went together best. Some look like they work on the wall but when you put the two fabrics together in the same light, they don’t work. The light really makes a difference. 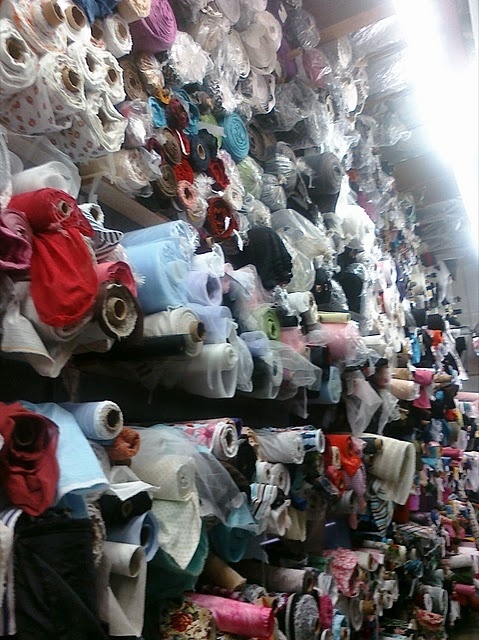 I was in fabric heaven! 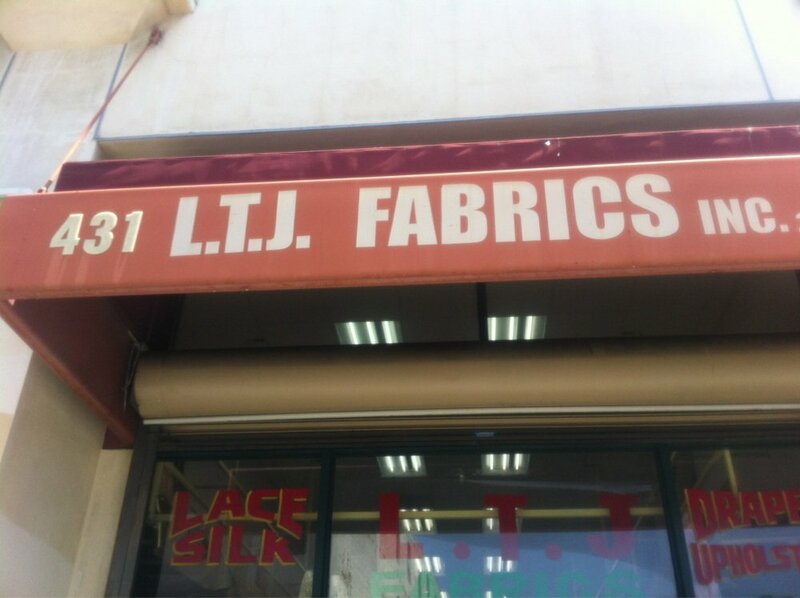 LTJ Farics, 9th Street Los Angeles, AKA Fabric Heaven. 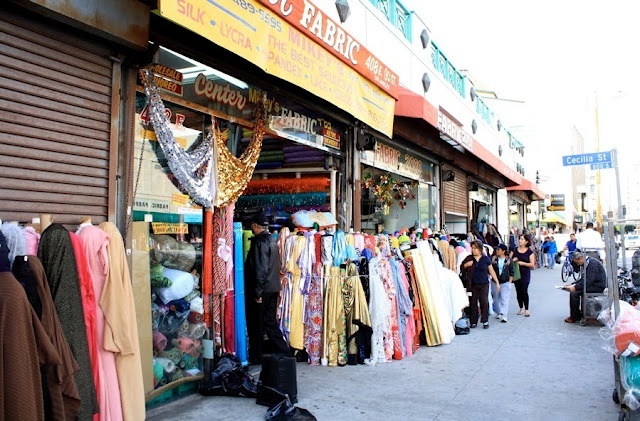 I bought a bunch of fabric at LTJ then decided to walk around and come back. By then my Homeless Lady Wheelie Cart was loaded and almost more than I could push so I made my way back to the van to unload. After getting some fabrics at some other stores I went back to LTJ and finished getting the rest of the fabric I needed. By then almost every dog picture had a swatch of fabric stapled to it. And I had some extra fabrics to play with if I wanted to switch. The Dogs of Le Chien and their fabric. Getting the main fabric is only the start of the quest. I then needed to get linings, tulle for skirts, trim, appliqués, and so on and so on. My journey took me from the appliqués stores for Macintosh’s outfit, to the trim stores, a store for the satin to match Murphy’s Pink peau de soie, the satin for Zoe’s Laser Cut Lace, tulle in every color, Satin for Rainey’s lapels, studs and chains for Luca’s faux leather and so it goes. Wall and walls of fabric! OK, the Homeless Lady’s Wheelie Cart is full again and getting very hard to push….so back to the van to unload but this time not without overturning it onto the sidewalk. Thankfully my purchases are all in plastic bags so they are safe. And thankfully some strong dude helps me get it back upright and moving again. I always wonder how the Homeless manage but now I’m getting a feel for the strength it takes to push all your possessions in a Wheelie Cart on uneven cracked sidewalks. And how exhausting it is. Next time I need to make more trips to the van. Tired and happy I hopped back in the Van and started home. I had hoped to get on the highway before traffic (do you see a pattern here? Am I kidding my self?) 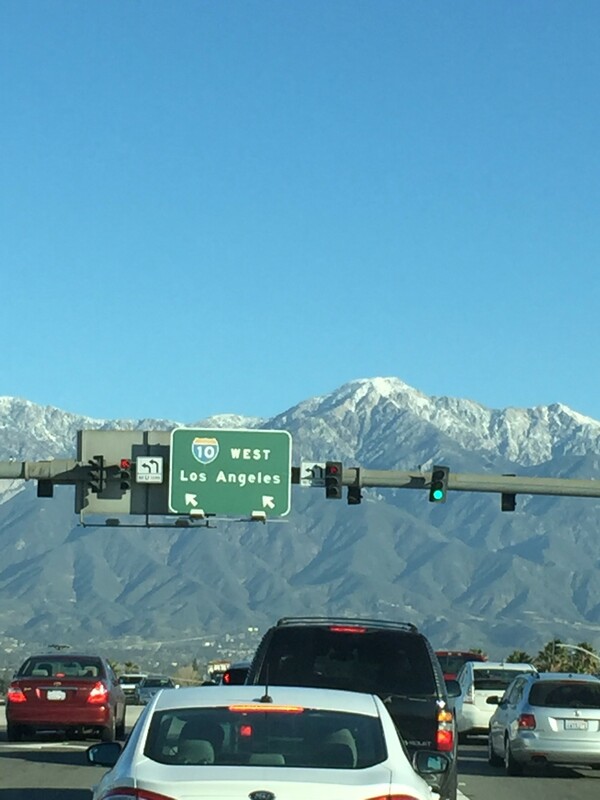 Well, traffic was temporary and I was moving along until I hit a huge accident in Fontana. The trip home wound up taking me 4 1/2 hours of mostly stopped traffic but I finally passed the accident, sent a prayer that no one was killed and made my way home to Palm Springs. Still happy, but very tired. 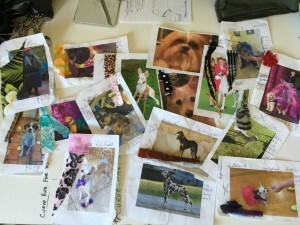 In my next post I’ll talk about how I design the outfits for the Dogs of Le Chien.